Well, we are going to look at a related conversation, but dear to our heart – well you guessed it. Yes, about cheap flights. In our continuos quest for cheap flights and deals, I wanted to see what students can get while looking for cheaper flight fares this spring break season either coming home or flying to some cool destination. 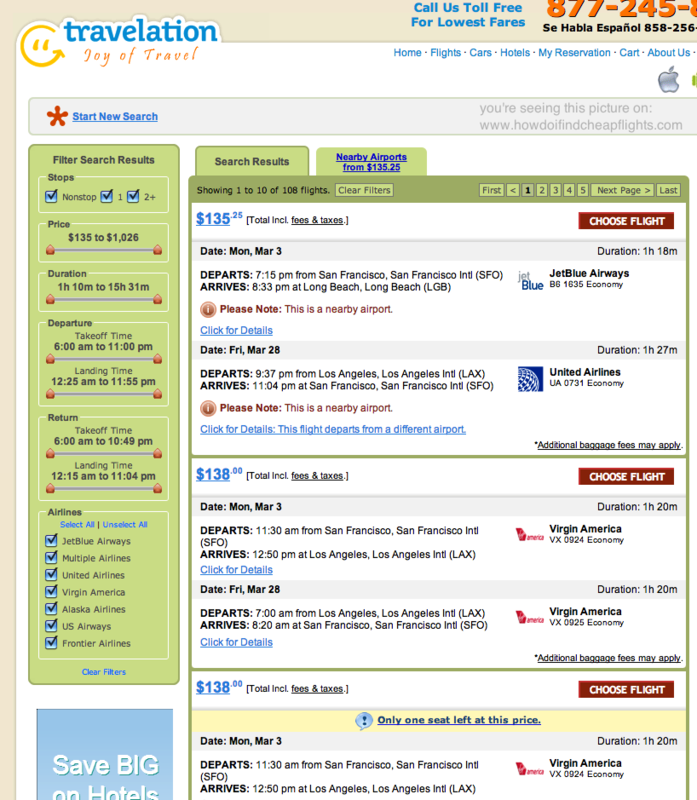 There are many different flight search engines that seem to claim to offer student discounts. I wanted to put them to test with our regular flight search engines. So, here we go. First of all, I want to put out a disclaimer, as usual. we am not affiliated with these student discount providers. Our only aim is to compare popular student flight discount search engines with other flight search programs. 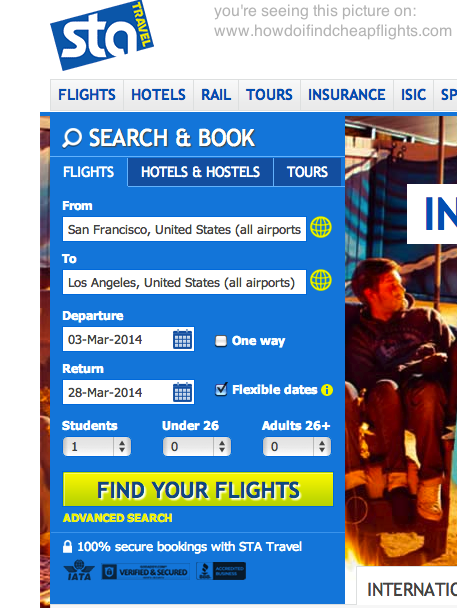 I wanted to see if these search engines who claim to offer cheap flights for students really deliver such discounts. Objective: Compare flight fare between student discount flight search engines and other retail search engines – Same itinerary, destination and dates will be used to analyze the fare comparison. 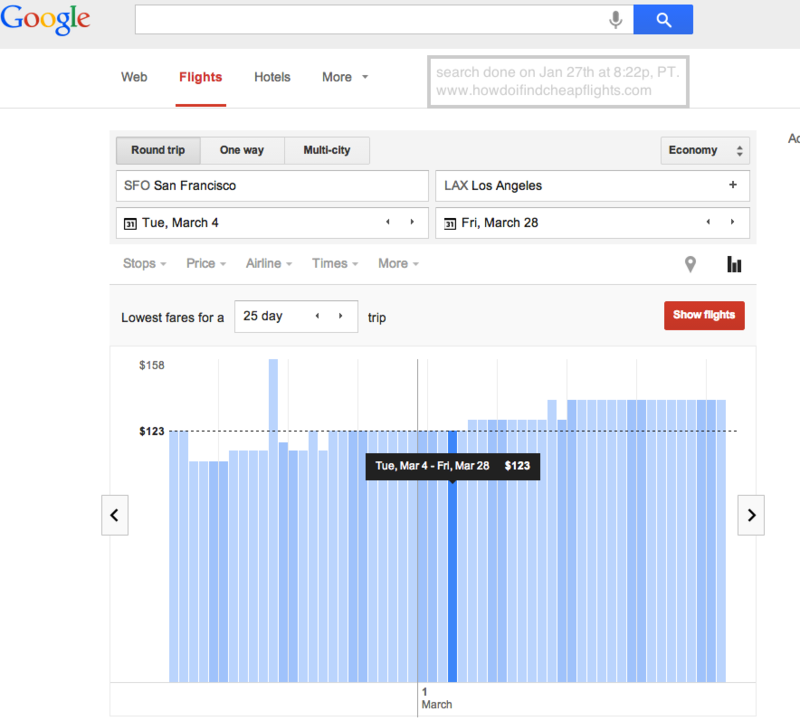 Round Trip flight from SFO to LAX, in the Spring Break 2014 season, March 3 onward and March 28 return for 1 passenger. STA Travel is a big player when it comes to student travel related areas. But, I am curious to see how their flight search tool compares in this test. We first test our itinerary with their flight search engine. Below are the screenshots. As you can see, we are looking for flights from SFO to LAX roundtrip on those dates for 1 passenger – here we selected STUDENT. STA flight search comes up with a clean option for different dates as a grid (See picture below). The cost for this round trip comes to about $128, although you can see that there are some cheaper fares if you flew around returning on Tuesday or wednesday the price seem to drop by about $4 making the fare to go to $124. 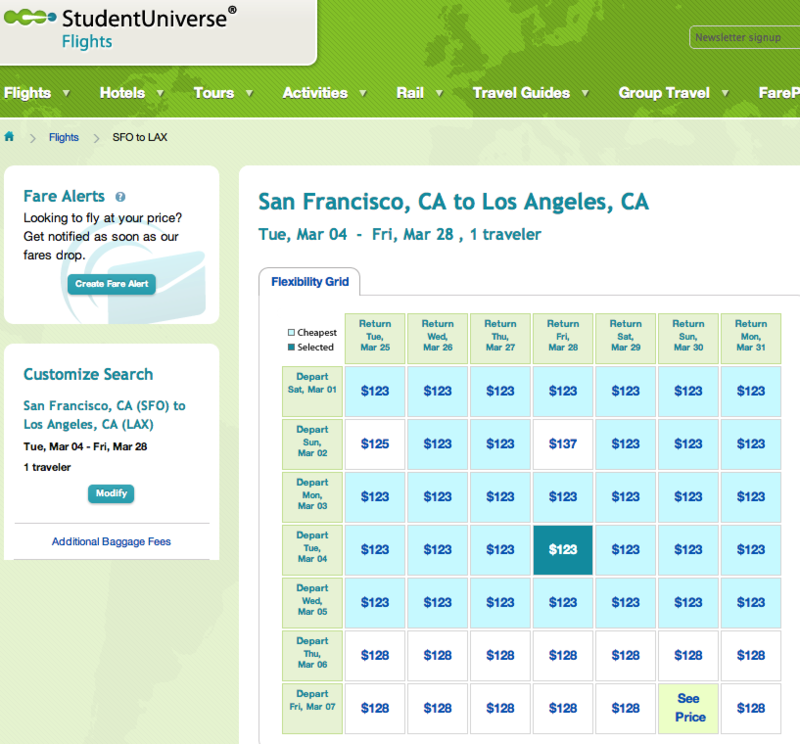 We use the other popular student discount website flight search tool to figure out their cost. Student Universe comes up with $123 as their best bet for the date and destinations we would like to hit that is from SFO to LAX roundtrip. 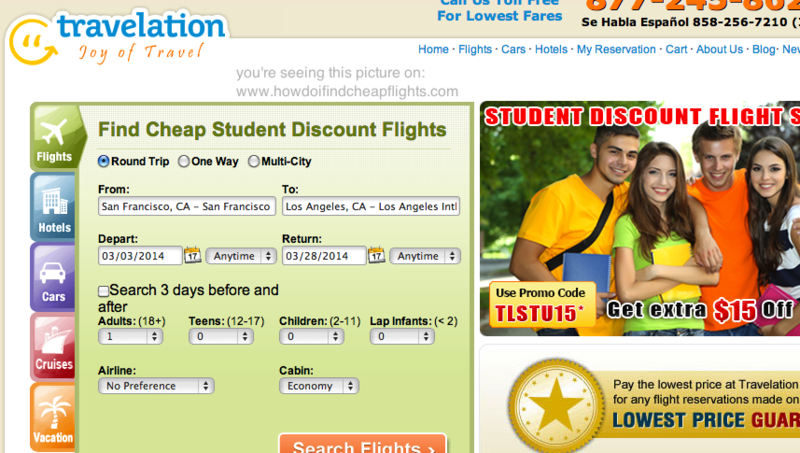 Next we hit the Travelation website with their student discount flight search tool. Notice that Travelation offers a generous(?) $15 OFF with a promo code. 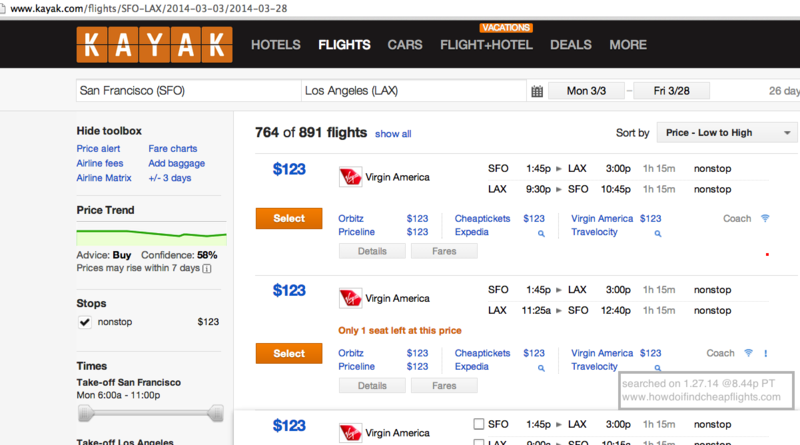 Then you look at the flight search results and their cost is around $135 to $138. Interesting thing is that, as you can see, all these providers are using Virgin for this route (SFO to LAX) as you might know (if you have been following our other articles from before) that Virgin is one of the cheaper airlines in the country especially for west coast destinations. So, if you applied the $15 PROMO CODE offer with Travelation, you will still be at $120, not a whole lot cheaper than what we have already seen. 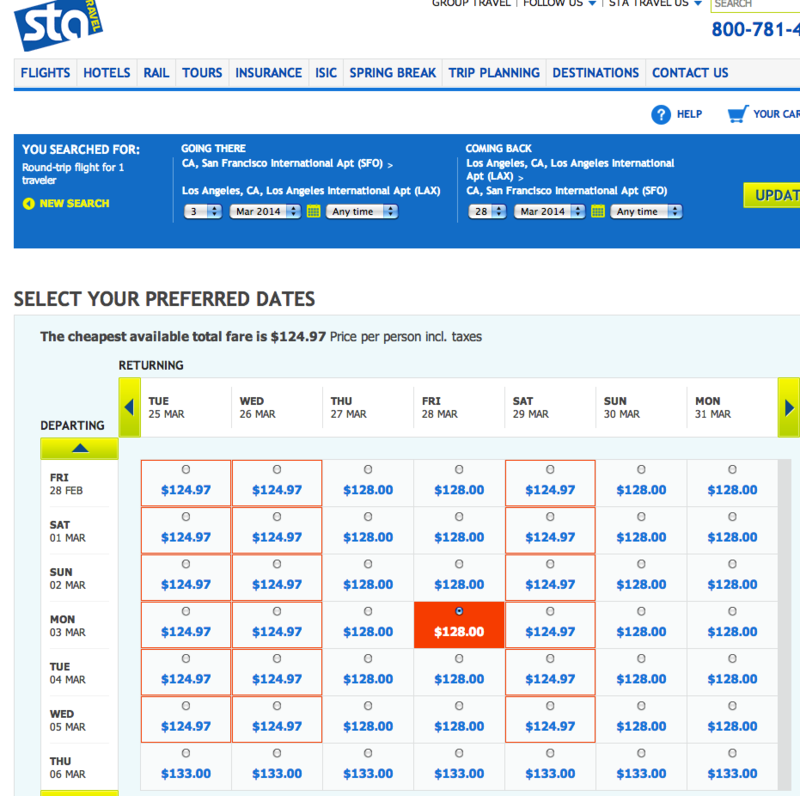 Then there are surcharges and other rates that takes your flight pricing elsewhere. Almost all search engines, in this scenario, seem to show that they land on similar cost range which is around $123 to $125. 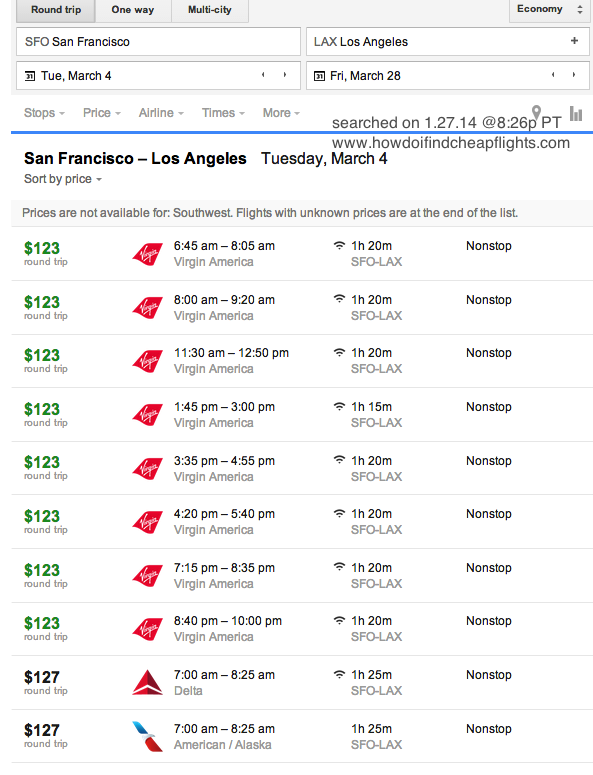 The so called student discount flight search tools didn’t seem to do anything differently. But, there are so many more things that go into finding a cheaper flight. You might want to look up these other articles that will help you look at different options when it comes to finding cheap flights. Our above analysis indicate that you are better off doing a comparison with retail flight search providers while shopping for your flight tickets this spring break season. I recommend that you use a combination of search engines and alternative methods as indicated in some of our previous articles (see some of the links below) and as outlined elsewhere in the Internet to double check what you’re getting is a good value. I hope that this was an informative article. 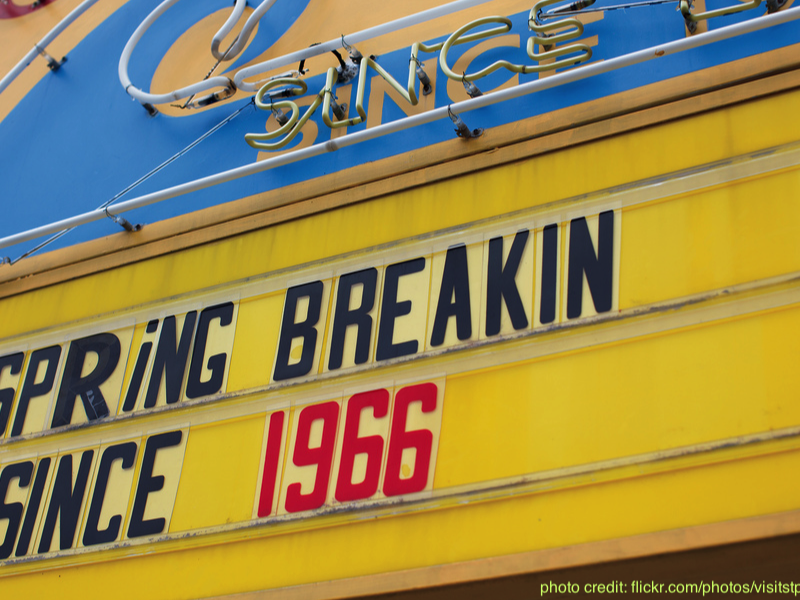 We will be shortly releasing a few other interesting ones related to Spring Break 2014.